Not Dead Yet Studios » I’ve moved! Or well, I’m in the middle of moving. My ancient Blogger blog is dead, and I’ve finally moved this whole site to WordPress. We’re fixing up the sidebars, changing up the portfolio, and generally trying to give it a face lift without actually doing a whole new design in the middle of the rest of the madness. If you were one of the awesome few reading off my RSS feed, the new feed is here, so pretty please update yourself! Otherwise, you’ll see a few things changing around and getting spiffed up over the next week or so, but feel free to point out if anything isn’t working for you! Also, I’m doing a Big Giant Sale over at Antemortem Arts in order to get plane tickets to my 72-year-old mother’s wedding. This includes my Be a Cartoon service, so if you’ve been wanting a cartoon (or for me to draw your Monster for you), please take a moment to check it out! 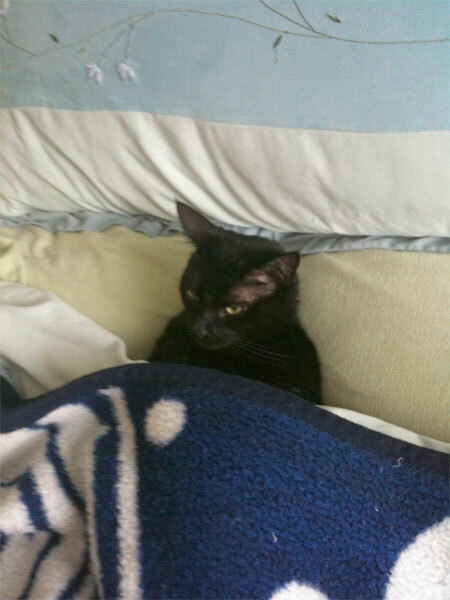 Also, please enjoy this photo of my cat, Pod, who tucked himself into my bed for a nap and then got annoyed when I woke him up with the camera.